On Wednesday I posted a little to-do list for my first Bloggiesta. Then I started blog-hopping. Then I started looking at the Mini-Challenges. Now my To-Do List has grown. Update Canadian picture books page Done! Put Cast of Characters on a static page Done! Here it is! Update Review policy Done! Here it is! Acknowledge the people who have created the cool elements on my page Done! Here it is! Update social icons to include Pinterest Done! Change my user name Done! Say hello to Perogyo! Unify the age tags for books Done! Meet other bloggers In Progress! Line up the header and sidebar Done! Connect with other bloggers on Facebook and Pinterest In Progress! 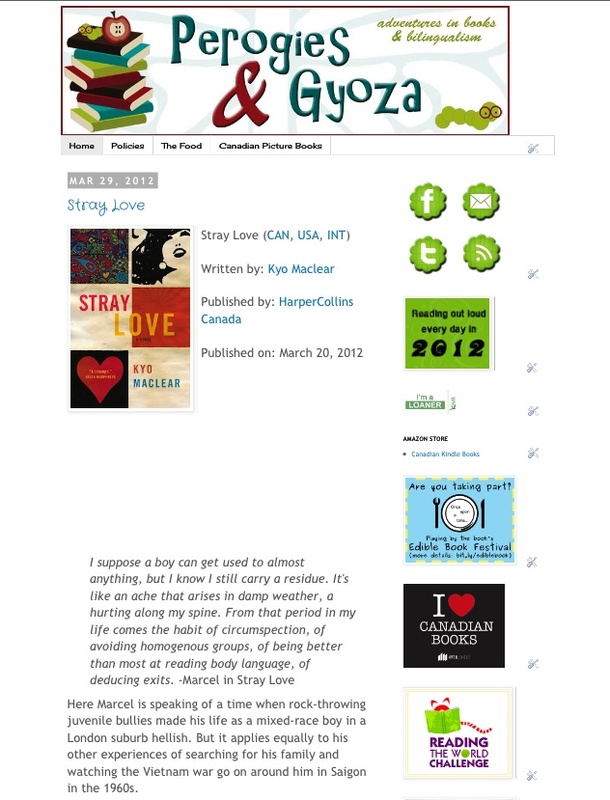 Add my blog to list of book bloggers on Pinterest Done! Ask for advice on title font Done! Add the reviews for the books I like best to Amazon, Indigo, Goodreads Done! Design a blog button for What Are You Reading Wednesday (if there is time - this is the big one) Done! When it is all spiffed up, back up my blog on Wordpress. Done! 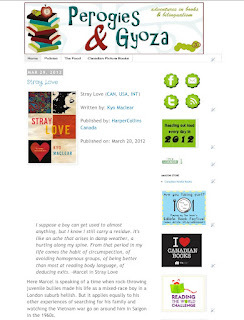 Here is what my blog looked like before I started. What's it going to look like on Sunday? I would love some advice though! What are the pros and cons of moving to Networked blogs? Do you hate my blog post title font? I love how it looks but I think it might annoy people, and some upper case letters are hard to read. I am practicing my Mr. Linky skills thanks to the mini-challenge at The Book Butcher. Please link me your blog or Bloggiesta post! You are making some great progress! What a good idea to post a pic of your blog "before". How did you do that? Hi Medea, another familiar face! So great to see that you're joining Bloggiesta! You have quite a long to-do-list here, but it does sound manageable. It's good that we have our tasks distributed across all three of us, so that's pretty much a relief. I have a few nachos and quesadilla over in my site, just in case you want to have a quick taste too. Best of luck! Virtual nachos and quesadillas, that's the healthiest! I will stop over, thanks for inviting me to the party! Your blog post title font works for me -- fun and playful and not that hard to read. The words aren't that familiar to me, so I have to read it slowly anyway! Great list! Hope you're having a fun and productive Bloggiesta! Thanks Joy! I did end up changing it but might change it back in the future. I have been having a lot of fun, thanks! Hi Medea, I linked up my most recent Bloggiesta update. Congratulations on getting the hang of Mr. linky! Nice work! Thanks for filling out my first Mr. Linky! Gosh, you've got a lot done already! Keep up the good work. Thanks! Hope yours is going as smoothly! You're almost finished! I was trying to decide what sort of theme page I could do...like what I'm known for loving...and I haven't thought of anything yet... Good luck today!